The availability of the intravenous anaesthetic proposal has opened the doors to the widespread use of total intravenous anaesthesia, one of the newest departures in anaesthesia. This is a straightforward, accessible introduction to the basic concepts provides definitions, historical perspectives, basic principles, and an overview of the drugs, their interactions, and the equipment used. 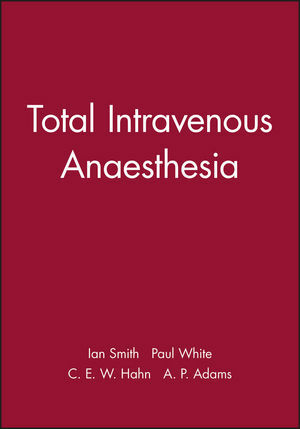 Ian Smith and Paul White are the authors of Total Intravenous Anaesthesia, published by Wiley. 1 Historical and Scientific Background of Intravenous Anaesthesia. 2 Types of Intravenous Anaesthesia. 3 Pharmacokinetics and pharmacodynamics of drugs used in TIVA: Sedative-Hypnotics. 4 Use of Intravenous Anaesthesia Techniques in Special Patient Populations. 5 Intravenous Anaesthesia Delivery and Monitoring Systems. 6 Advantages and Disadvantages of Intravenous Anaesthesia. Organ and Tissue Toxicity. 7 The Future of IV Anaesthesia.